I was sitting on my bed after opened the window and letting some fresh air entered my room, so cold till my nose felt like it was pierced by something. It was early in the morning, cold and quiet, yet I had to get myself prepared because I remember that I had an appointment with my friend to go to the market. We needed to buy some food as we were going to have special event that weekend despite the mid exam that kept me so busy to get my assignments done before deadline. I managed to have showered when a Whatsapp message showed up on my phone screen. It was my sister. She told me that mom had to be rushed to the hospital because of her severe abdominal pain yesterday, and that she wouldn’t be able to go home to accompany mom. Mom felt so much pain in her stomach until doctor asked her to stay in the hospital. I bet mom did not want to tell me directly because she knew that I wouldn’t be able to concentrate on my exam since I easily got distracted in hearing bad news, particularly if it had to do with my family. My plans that morning became cluttered as the news made me missed home even more, and my feeling overwhelmed by wanted to be with my mom. And yes, the news distracted me. After had a battle with my mind and heart, I decided to went to the market with my friend first, before I told her that I wouldn’t be able to attend the event since my mom was sick and I needed to get home soon. I immediately prepared my bag and everything after getting done shopping in the market. I decided to go home, even though I knew that I still had some tasks to be done, but I couldn’t help! “I can do it on the bus”, I told myself. Few months before, I also stayed at the same hospital, in Siloam. It wasn’t the first time to me, since I already experienced with needles when I was just 2 years old. But that was my first time again to be hospitalized after the last time when I was in junior high school and it was never a pleasure to spend the time there. I was rushed to the hospital because of severe dehydration. The needle wont’ penetrated my vein well because the vein turned to be more flattened from ordinarily stood out until I had to experience two times failure before eventually the needle found my vein. The first day I was treated, I wanted to go home. It was the hardest day. All day long, I just watched the clock knocking, from minute to minute. I couldn’t read the books although I wanted to, because I’d get dizzy easily. Just watching a boring TV program, not being able to move freely, couldn’t eat spicy food, even I got so startled by just hearing the sound of the footsteps in the corridor. I thought it was a nurse that was going to give injection, or another terrifying treatment for me. I am 20 years old now but I can’t overcome the fear of injection completely. Anything that has to do with a hospital became very scary. After two hours, I finally arrived at the hospital, I brave myself to enter the lobby and searched for my mom’s room. I came there with a large backpack because I was planning to spend my weekend there before went back straight to my campus life in Jatinangor. No significant changing in the hospital since my last visit. As soon as I opened the glass door, I could smell alcohol. The smell was a mix of pine fragrance from the floor, food, coffee—from the canteen that I passed to reach the elevator—Alcohol, and people. There are a lot of people in the lobby. I once got so dizzy by only watching people back and forth in the lobby, along with the noises from their chatter, or the children’s cry. I sometimes thought that working in the hospital was not healthy at all, particularly for me that easily got sick, since most of your time in a day spent with unpleasant smell, surrounded by many patients and unhealthy air. But it was just my random thoughts anyway, however many people managed to stay healthy even when they had to worked 24 hours in the hospital. My mom’s room was on the 6th floor. And I just realized that it was the same corridor with mine when I got hospitalized few times ago. I knocked the door and I could tell that she was surprised to see me came from her facial expression. “I thought you’re supposed to attend an event with your friend. It’s still the mid exam week, isn’t it? You don’t have to come here if you’re busy” mom was being mom, despite the fact that she was sick. I grinned, “No, mom, I am not that busy. I canceled my plan to attend the event, that’s okay, I can join the next event if I want too. Besides I’m really homesick in all of sudden”. Mom could understand and she told me that her stomach was not as painful as she felt yesterday. The doctor told her that she could go home after two or three more days. It was a relieved to hear that. My mom was not alone there, her older sister—or whom I used to call Uwak—accompanied her meanwhile my father needed to take care of my brother and keep the house. He was in his free time, because if he was on his duty then he was going to be away from home for a long time. He sometimes came to the hospital to drop some food and brought other needs for mom. But since I was there with mom, I could replace my father’s role. The room where my mom stayed was clean and tidy. The first thing I could smell clearly when I entered the room was the smell of coffee because of the air freshener spray. It was good that I could smell less of alcohol, and the atmosphere become more comfortable. In the corner was a big window without trellis so that people in the room could see buildings behind the hospital which looked similar to a factory, some of them looked more like a warehouse. Behind the building was the railroad, and on the edge of it was a wide green meadow and it looked like there was a hill in the distance. The green grass was so beautiful. My mother once told me that she wanted to play and run there, on the green field, like what she used to do when she was just a child. In the afternoon, I could see the sunset from distance. The sky color turned slowly from blue to bright orange and red, before it got dark. So mesmerizing and relaxing at the same time. I never knew that I could felt this calm in the hospital. In a building where I could find my fear easily. I spent the day in the room with lots of talk with mom and uwak. During night time I couldn’t slept well since the nurses got into the room every few hours to check the infusion. Every morning, I got to go down to the canteen for a free breakfast or brunch. I could use the elevator many times a day to manage various necessity or just simply bought the food that mom wanted to eat. 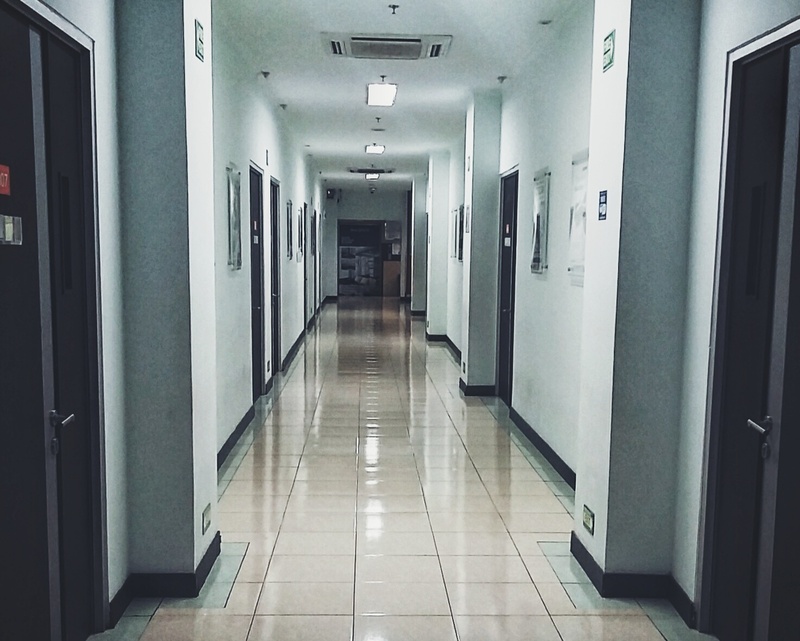 Passing the corridor with a thick alcoholic smell and particular rooms that sometimes filled with tears was indeed frightening but surprisingly I could just ignored all of my fear only for mom. I was glad and yet shocked at the same time that I could handle lots of things in the hospital by myself, when yesterday I was very scared and struggled to brave myself. I never regret the fact that I canceled the event which I was going to attend, because it was all paid with a quality time and a good moment with mom and uwak. Mom went home on the fourth day so I could went back to Jatinangor peacefully and joyfully as I could conquer one of my biggest fear.